El Paso County Parks is set to reopen Rainbow Falls Historic Site for the season at 10 a.m., Saturday, April 6, despite Serpentine Road still being closed. Serpentine Road is closed to vehicles. Access to the County park with the Fountain Creek waterfall will be limited. Parking is available near the top of Serpentine Road via Highway 24. Park visitors will have to walk about a half mile down and up a steep grade to the entrance. 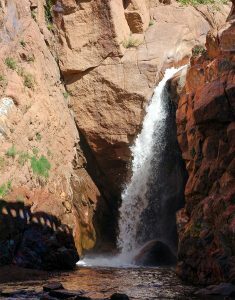 The Rainbow Falls Historic Site, just outside Manitou Springs, consists of the namesake Rainbow Falls and a small series of waterfalls downstream in Fountain Creek. The five acres are developed with a parking area, trailhead, covered kiosk with historical and geological interpretive information, picnic benches and tables, a 0.15-mile trail from the parking area to the Falls, secondary trails along Fountain Creek, and viewing overlooks. The regular hours for the Historic Site are 10 a.m. to 4 p.m. on Saturday and Sunday. • Serpentine Road is closed from the City of Manitou Springs to the Rainbow Falls Historic Site. All access is from Highway 24 on Serpentine Road.